This week I’m working on some mixed media pieces for an upcoming show in Atlanta (more details on that later). I was completely stumped over what to make, until I stumbled onto this idea at Penland, back when I was teaching in the spring. 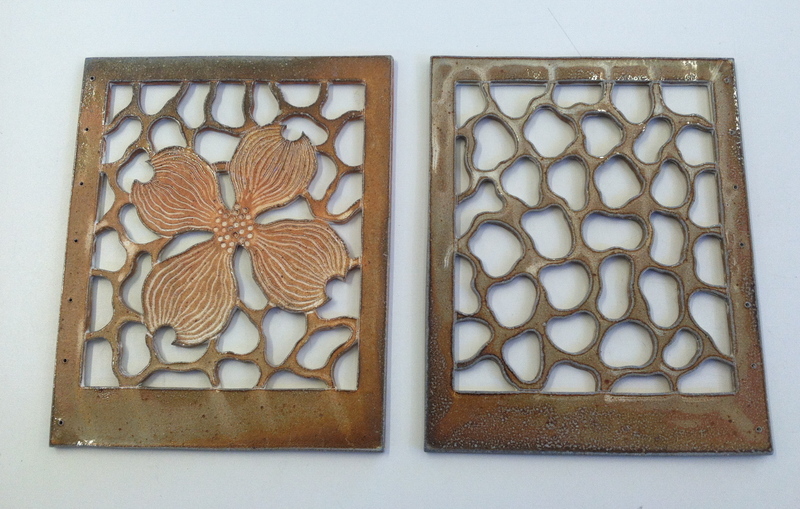 I was working on a piece for the scholarship auction, a collaboration with ceramic artist Seth Barendse. 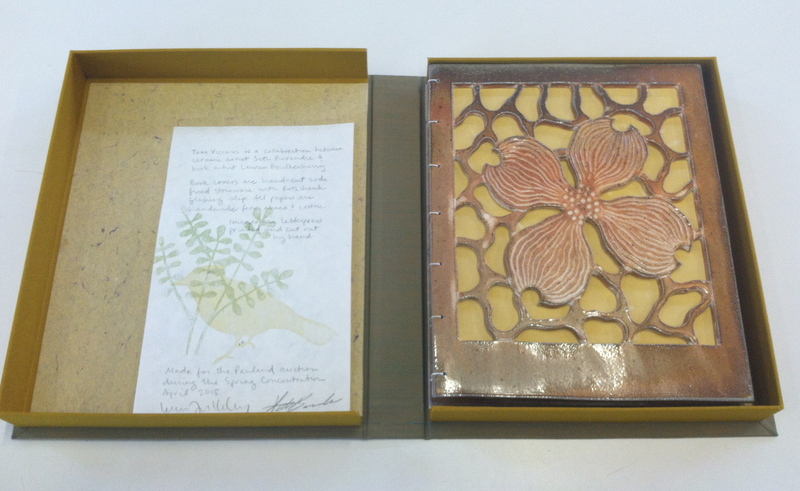 He made these amazing ceramic book covers with cut-outs, which blew me away. When he brought them into the studio, I had two thoughts: first, These are amazingly lovely, followed quickly by, What in the world am I going to put inside them? He set a high bar, that Seth. There was a lot of coffee, a lot of head-scratching, and a dash of anxiety as the auction approached. Eventually I landed on the idea of layering images of plants and animals native to the Penland area and started drawing. My idea was to play. Play with layering transparent colors, experiment with layering images. Photopolymer plates were made from drawings of mine, and I carved a few linoleum blocks of silhouettes. 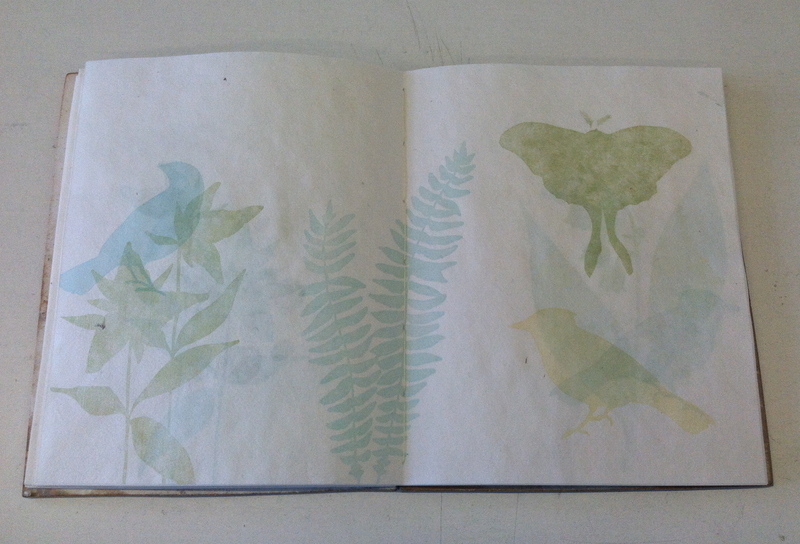 I used handmade paper (a cotton/abaca blend) that had enough translucency that the images began to show through from the back sides of the pages as I was printing. A happy accident, to be sure. This created more complexity, but it was still lacking. I didn’t want text, but wanted more variety in the pages. So the cut-out idea emerged. The patterns are based on cellular structures of plants (as seen through a microscope). I liked where this was going, but I was running out of time. I’d finish this piece for the scholarship auction with no problem, but I needed to leave something for the big auction in August, too. I have plenty of editioned books, but really wanted to make something new. The finishing touch here was a protective clamshell box. Completed with mere hours to spare. Finished size: 8″ x 10″ with 40 leaves. Now I know how the chefs feel at the end of Iron Chef. I decided to make a second, different version of this book to leave for the August auction. I printed more layers, cut more cellular patterns, did a case binding that was somewhat miraculous–but when I made a slipcase for the book, I woefully miscalculated. Sleep deprived and in a hurry, I made a lovely case that was about 1/8″ too wide. The book looked ridiculous flopping around in this case. If my mentors from my grad program had seen it, they wouldn’t have claimed me. It was simple enough to make another case, but I hated to waste one. So I thought about how this book didn’t have text, and how it might be a little too mysterious because of it. I mean, there’s a fine line between mystery and confusion, right? What if I included some context? Maybe some semi-fictional context? I could create a softcover pamphlet that would fit inside the slipcase and act as a companion piece. It would fill the gap, but could also connect a few dots about the content of the book. So I created a pamphlet and a backstory. This is the hazard of being a fiction writer at heart. Imagine an artist visiting Penland for the first time. She keeps a sketchbook filled with drawings of the plants and animals she finds, and collects odd facts and folklore about what she observes (example: folklore says that whip-poor-whills step into lady’s slippers in the night when they want to be fancy and go a-courtin’. How adorable is that?). 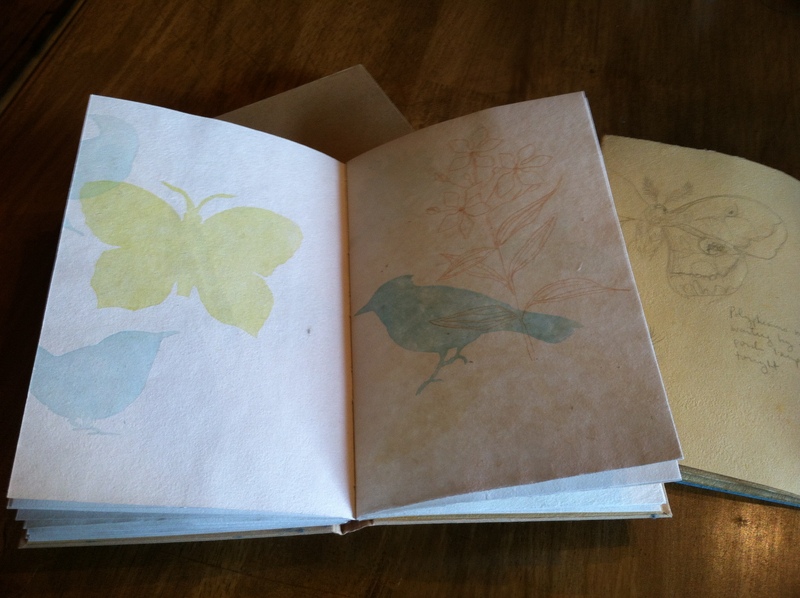 She then creates a book that layers images based on those drawings, with a nod towards the rare and mysterious. Fictional person (sort of), real facts and lore. In the end, I wasn’t happy enough with the second book to leave it for the auction. 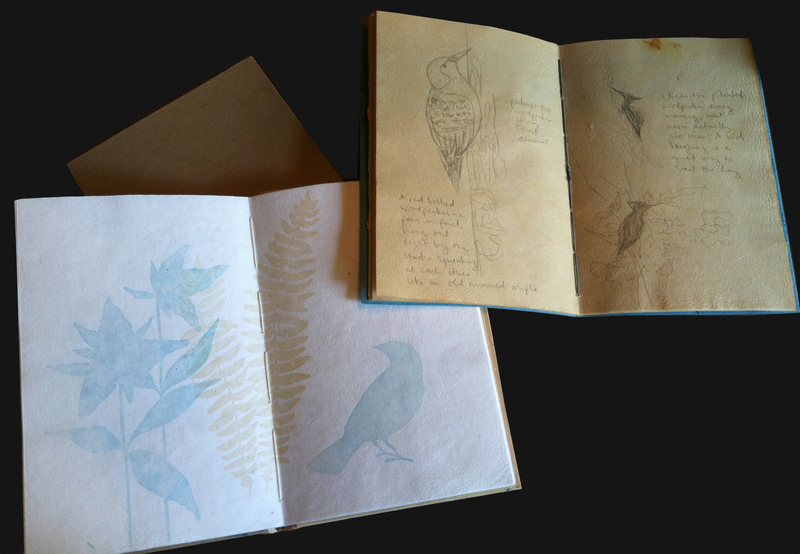 But I liked the idea of making an edition of it, complete with the companion pamphlet that would be a somewhat fictional window into the artist’s brain. It became almost like a journal of my alter-ego. So it seems I owe this breakthrough to my ongoing struggle with math, and the old “measure twice, cut once” mantra that I so often forget. But I like this reminder that not all mistakes are bad. Sometimes they’re just the kind of prodding that you need. Next time: I finally get around to starting that art-in-the-mail project. 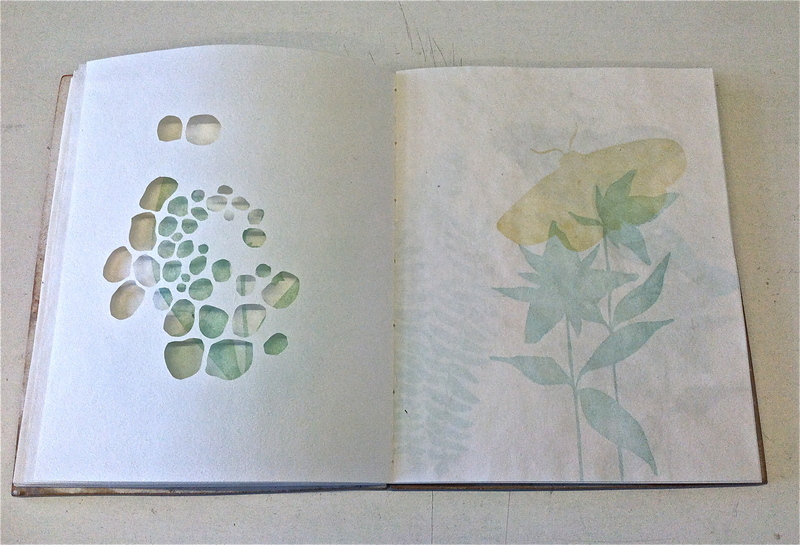 And later: the mixed media pieces that grew out of this collaborative book.